Birds in a Park is conceived as a counterpart to the exhibition The Floating Feather that took place at Galerie Chantal Crousel in Paris in December 2006. Like Birds in a Park, The Floating Feather presented works by Isa Genzken, Keren Cytter and Fong-Leng. The invitation cards for both shows feature reproductions of paintings by Melchior d’Hondecoeter. The titles of these paintings were used as titles for the exhibitions. Melchior d’Hondecoeter lived and worked in Utrecht and Amsterdam from 1636 until 1695. His oeuvre consists almost entirely of portrayals of birds, to whom he attributes certain psychological and metaphorical qualities. 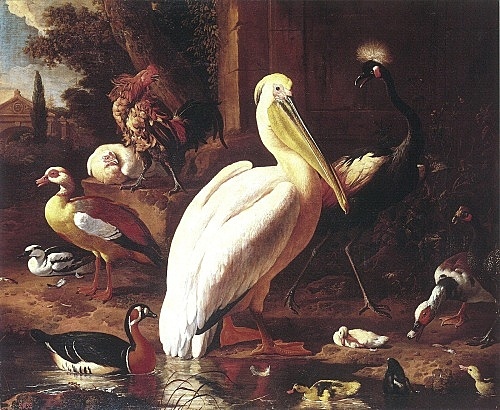 Birds in a Park (1686) was produced for the hunting lodge of King William III, and is part of the collection of the Heremitage in St Petersburg. In this painting, d’Hondecoeter depicts a heterogeneous group of birds grouped around a pond in a dynamic composition. Some are precious and exotic to the northern climat, like the crane and the pelican, whereas others are more common, such as the shelduck on the left. D’Hondecoeter often recycles pictorial elements in his works. Certain birds return in identical composure in different paintings, so that some of Hondecoeter’s works read like collages. Birds in a Park reinforces as well as comments on the prevailing tastes and power structures of its time. The painting and what it represents – rather then its title – could be seen as an emblem for the exhibition. Fong-Leng was born to a Dutch mother and a Chinese father in the 1930ies in Rotterdam. 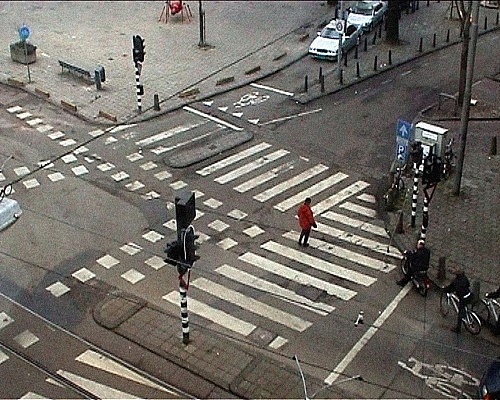 She opened her first boutique in Amsterdam in 1971 and quickly gained success with her unique and – conform the criteria of her clientele – extravagant garments. Her theatrical fashion shows, in which she played an important role as main model and primary marketing tool of her own production, created scandal and excitement in the Netherlands all through the 1970ies and -80ies. Her style was affiliated to the work of contemporaries Ossie Clarke and Zandra Rhodes, but Fong-Leng sees her creations as sculptures rather than clothes, and in interviews repeatedly referred to the production of her pieces as a process of construction, or building. Thus Fong-Leng created a peculiar niche through which she separated herself from the mainstream, while simultaneously making excellent commercial use of it. Fong- Leng’s works have a strong formal or representative character, reminiscent of traditional oriental ceremonial clothing. The robemanteau is a favorite model, often made out of richly decorated leather or suede. 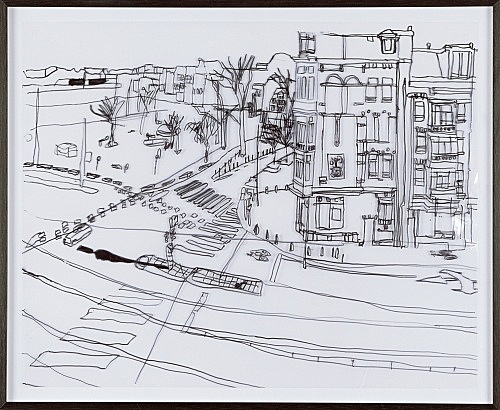 Galerie Daniel Buchholz now shows three works of Fong-Leng – a loan from the Scheringa Museum for Realism in Spanbroek, NL – that mark the transition from flower power to punk, dating from 1976 to 1981. In a documentation video of Fong-Leng’s 1983 collection-presentation at the Hilton Hotel in Amsterdam Fong-Leng wears Anniversario, a leather suit decorated with applications of birthdaycakes and burning candles. Isa Genzken’s approach to sculpture is as analytical as unconventional. 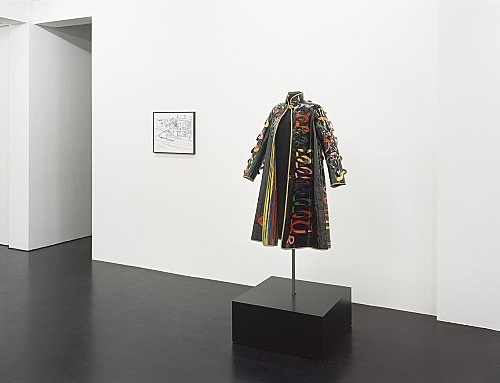 From the mid 1970ies she investigated a wide range of artistic, psychological and socio-political topics, while at all times thematising the basic premises of sculptural practice. In Birds in a Park Genzken shows two untitled pieces. One piece consists of two identical sets of two monumental reproductions that are printed on paper. 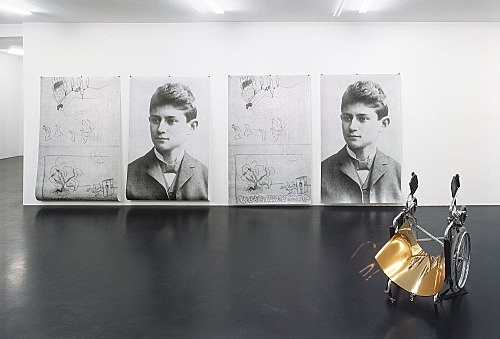 One features a portrait of a young Franz Kafka, the other an elegant, playful drawing Kafka made in the same period depicting what looks like a coach on a winding road. All four prints hang loose from the wall, granting the flat objects a sculptural dimension. 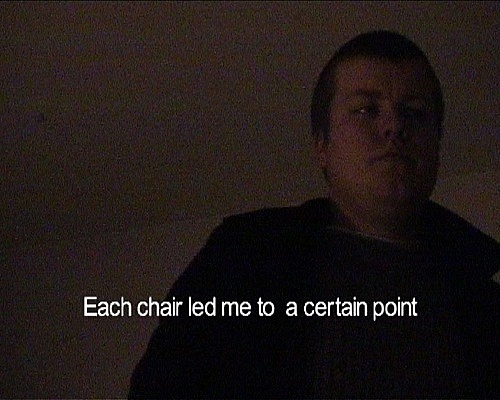 The other piece comprises of a wheelchair that is knocked over, so that its front wheels are directed upwards. A bended strip of golden mirror foil rests on its seat, producing a warped reflection of its surroundings. This distorted view not only implies the fear of falling (when disabled) but also the fear of being disabled (when mobile). This piece is part of a group of sculptures based on buggies, medical walkers and wheelchairs, that produce a complex of angles on the notion of movement. While wheelchairs are designed to set motion to that which is (or became) stagnant, they simultaneously need this stagnant element to be set in motion. In the particular piece on show here however, even the suggestion of mobility has come to a brutal halt. 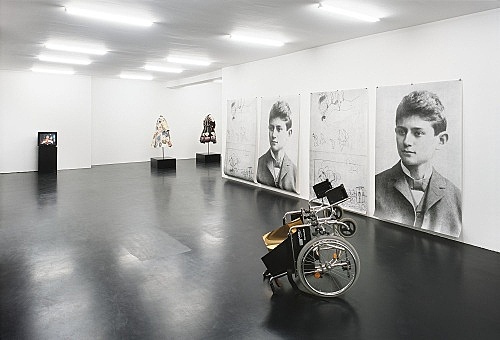 Genzken’s wheelchair pieces present an effective yet bitter metaphor for the symbiotic entanglement of motion and stillness, of power and dependency, and of life and death. 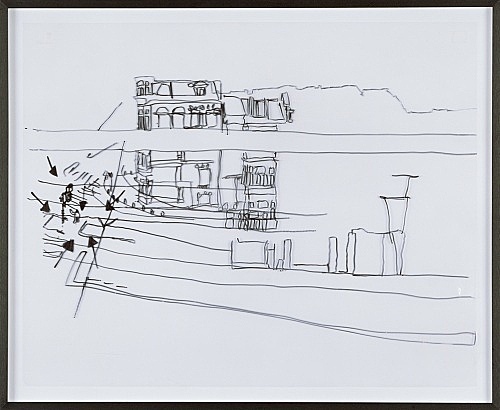 Keren Cytter’s (*1977, Tel Aviv) artistic production comprises of drawings, writings, and short narrative films shot on video and film. Her time-based works mix a variety of disciplines and styles, ranging from documentary, mockumentary, Greek melo-drama, slapstick, satire or sit-com to soap, home-movie, musical or Brechtian theatre. Cytter does not seem primarily inclined to impress on an aesthetic level, but this modesty (or is it pragmatism?) is royally compensated by intricate narrative layers, that lend each of her works its characteristic, epic out-of-controlness. Though Cytter’s rough, trade-mark camerawork initially seems the result of loose improvisation rather than a systematic approach, all her pieces are meticulously scripted and staged. Cytter’s deconstructions comment on the genres they quote, and at the same time propose an alternative for contemporary image production. 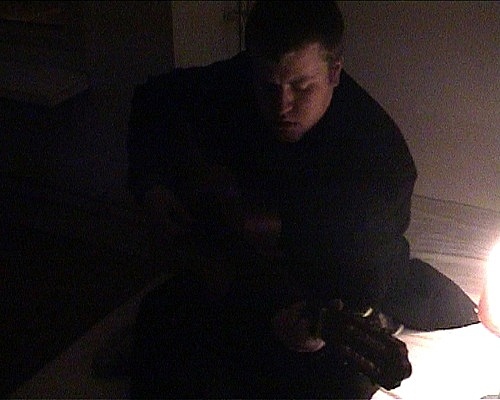 In Galerie Buchholz Cytter shows a program of three short video films. Tal and Namaa is a mini-musical in which two friends reflect on their friendship. French Film undresses the idiosyncrasies of French cinema. In Nothing a young man descends into his own psyche by scrutinizing the interior of a stranger’s apartment. As a means of coming to terms with the exterior world, he traces what he sees through the window on the glass with black pencil. 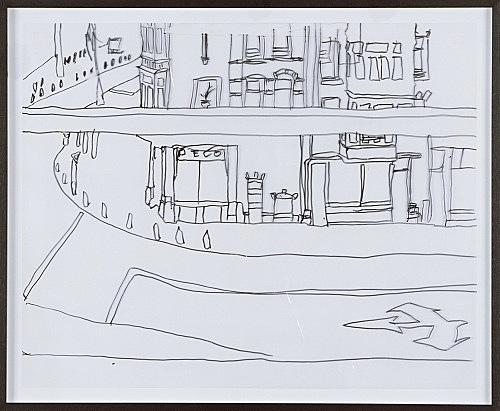 One of these drawings, or filmprops, is also shown in Birds in a Park.